The LAB DRYER is an under counter glassware dryer designed to handle a wide range of laboratory glassware positioned on baskets and coming from a Steelco LAB 500 series automatic washer disinfector. 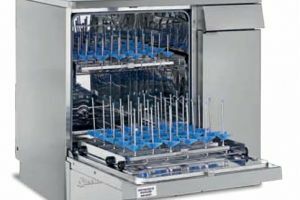 This unit has 2 separate drying injection connections allowing the use of all the dedicated LAB 500 series upper and lower washing carts. 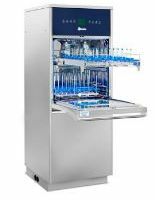 The upper level has telescopic bearing rails enabling the use of specific upper wash carts. 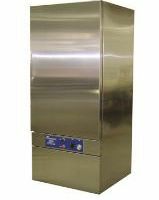 The drop-down door provides a loading platform for lower and dual injection wash carts for a convenient loading and unloading job. 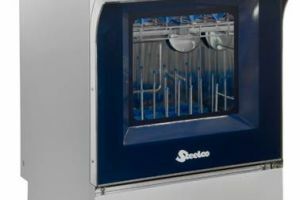 By skipping the drying phase using an external device, the automatic glassware washer can be loaded for the next cycle earlier. 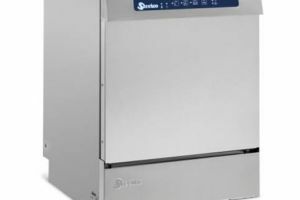 This combination provides the same throughput of glassware as 2 individual glassware washers. • Counterbalanced for ease of operation, stainless steel AISI 316L (DIN 1.4404) drying chamber side, stainless steel AISI 304 external side. • The door acts as a loading platform for lower and dual injection wash carts for a convenient loading and unloading job. • The upper level has fully extendable telescopic bearing rails enabling the use of specific upper washing carts. 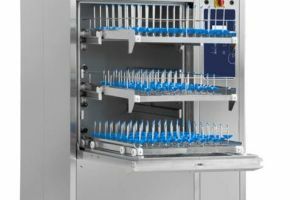 • Forced hot air drying system with 2 connections (upper and lower): in the chamber, through the wash carts injection system / washing arms. 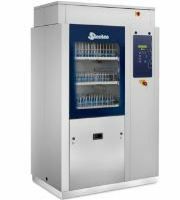 • Air circulation in the chamber, and through the wash carts injection system / washing arms. 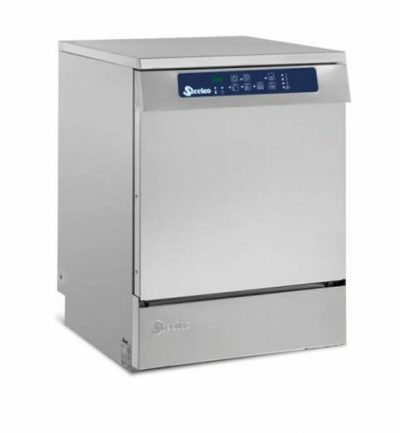 • The electronic programmable microprocessor allow the use of 2 adjustable drying programs set as standard with a duration time of 20 and 30 minutes. 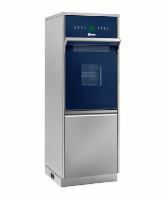 An additional program is dedicated to maintain temperature. 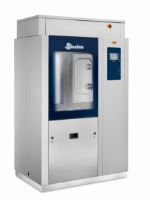 • Eliminates the safety hazard associated with guillotine type doors.